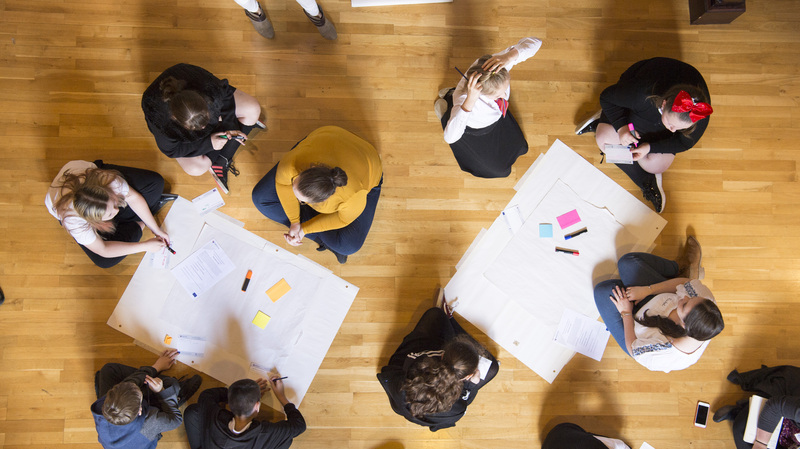 European Researchers’ Night, or Explorathon as it is known across Scotland, has become an established event in researchers’ public engagement calendar going from strength to strength across Europe since 2005 when it started, and since 2014 in Scotland. It is funded by the European Commission under the Marie Sklodowska-Curie actions programme and it is an opportunity for researchers to showcase their work the last Friday in September in a public engagement extravaganza. The EMOTIVE team spans France, Greece, Ireland, Italy and the UK which gave us the opportunity this year to take part in European Researchers’ Night more than once in the same day across Europe. The Glasgow University team jumped at the chance to set up a stall in the Hunterian Museum, one of the Explorathon venues, in order to let museum visitors be the first to try out the prototype of our EMOTIVE digital story about Ebutius, a Roman centurion who left his mark on the Antonine Wall. Visitors were able to hear Ebutius tell tales of his time in the Roman army stationed in Caledonia while looking for evidence from objects on display that have inspired our research. Meanwhile, in Athens, our ATHENA research team took the opportunity to show Ebutius’ story to Greek visitors to their stall, in a remote demonstration of the same story at the local European Researchers’ Night. In Glasgow, apart from a range of adult visitors visiting our stall and the exhibition and giving us valuable feedback, the Explorathon team and Ruth Fletcher, the Hunterian Student Engagement officer helped us also arrange a visit from a primary school class from Castlemilk in East Glasgow. A group of 27 keen and enthusiastic 11-year-olds accompanied by their two teachers helped test Ebutius’s story using the app in the exhibition. Not only that, but they also participated in the story-design process assisting us in the development of a new story about Verecunda, a local slave girl who also lived during that period and whose gravestone is on display. The Glasgow EMOTIVE team was assisted on the day by Sara Perry from the York team, who travelled north to give us valuable insight about the whole process, and 12 student volunteers from Glasgow University’s Museum Studies MSc, who were at least as enthusiastic and keen as the schoolchildren and did an excellent job facilitating the story-design process and evaluating the use of the app. The Hogwarts-like entrance to the Hunterian Museum and some of the amazing objects on display from the collection of William Hunter, the museum’s founder, were not missed by the pupils who appeared initially awe-struck by the whole experience. Once settled in the main hall of the museum, we split the class in two groups and asked the first to try out Ebutius’s story on the android handsets we had set up, and invited the other half to engage in some creative writing and drawing to test some of our research on writing stories about historical characters, in this case, Verecunda. The groups then swapped over so that everyone could try both experiences. Judging by the relative silence and engaged concentration from the Ebutius group in the Antonine Wall display and the audible debate and creative buzz from the Verecunda end of the museum, the engagement with both activities from the school group was a great hit! One pupil commented that “I felt like I was there. It was quite strange because it felt like he [Ebutius] was talking to you in real life”, reassuring us that we are on the right track with our EMOTIVE research, testing the potential of digital storytelling for bringing history to life and encouraging an empathetic engagement with heritage and the past. The experience helped us identify some glitches with the audio and the navigation of the app, but much fewer than we expected from an early prototype. Nearly 40 visitors tried out our EMOTIVE digital story in the Antonine Wall display at the Hunterian Museum on that day, providing us with valuable insights from actual visitors about what they enjoyed, didn’t like and early formative evaluation that we can feed back into our next steps in the design and evaluation process. All in all, a very successful event that helped us engage with a variety of our end users and target audience and gave use a lot of ideas for our future work.